One of our most amazing dispersed camping spots on our trip was just outside Yoho National Park in British Columbia. We camped for three days at the Wapta Falls Rec Site, which had two private campsites separated by about 100 feet of forest. Our campsite had a spectacular, unobstructed view of Wapta Falls, which was only 1/3 mile away and roared loudly. Behind the falls rose two 10,000+ foot glacier-covered mountains. The 10-story-high Wapta Falls was the widest waterfall we saw on our trip. This is a closeup view of a rainbow over Wapta Falls from inside Yoho National Park. 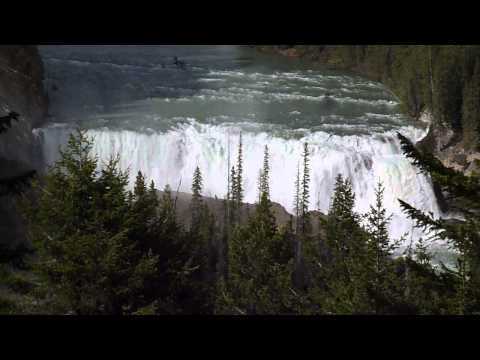 And here’s a video of Wapta Falls from our campsite. While hiking in Yoho National Park, we were amazed that with binoculars, we could see our RV parked at our campsite. We drew a red circle around our RV, which is just a white speck in this photo (click on the photo for a larger image). Another reason why this was an amazing campsite is because it was frequented by black bears. We saw at least one black bear every day we stayed at this campground. One morning I awoke when I heard someone knocking on our RV. I climbed out of bed, looked outside and saw nothing. Theresa and the dogs were still sleeping, so I figured I must’ve been dreaming. I laid back in bed, and moments later I felt the RV rocking. Now I knew for sure that someone was outside our RV. I opened the back window next to our bed and was shocked to see a large black bear chewing on the leather cover of our RV tow bar. I woke up Theresa, and we both yelled and shooed the bear away. The dogs awoke at all the commotion, but they had no idea what was going on. It wasn’t until we opened the door after the bear had fled the scene, that the dogs got a whiff of the bear and started going crazy barking and running all around the campsite. The bear left us a souvenir—four bite marks and some spit on our tow cover. We found this campsite (or so we thought) on a topo map. We setup camp, spent the night, and had just finished breakfast when two pickup trucks pulled in quickly. One guy jumped out, ran over to our RV, and knocked on the door. “What are you doing here?” he asked. We replied that we were camping. He told us that the Wapta Falls Rec Site was actually two miles down the road, and this spot was a river launch for the local rafting companies. I apologized, and he said very nicely, “No worries, mate. But you have about 10 minutes to move your RV before 100 rafters show up.” We immediately sprung into action, broke down camp, packed up and left in about 8 minutes, by far our fastest ever. Fortunately we’d had lots of practice by then and were able to get out of there before two buses arrived full of people and rafts. In hindsight we should’ve realized the river access here was just too good for a regular campsite. We had an interesting wildlife experience at this original campsite too. A deer jumped out of the forest and into the river, floated a couple hundred feet downstream, then climbed out the other side. We never did see what the deer was running from, but it must’ve been scary enough for a deer to risk his life like that.